Here’s a story that a friend of mine told me a while ago. I sent an email about it to a bunch of friends and a week later it was forwarded back to me after it had traveled around the world. I might have used some more descriptive words then was originally told to me, but as far as I know this story is entirely true. A friend of mine was working in a pickle warehouse as a summer job. He would do a number of tasks including loading barrels with cucumbers. These wooden barrels were enormous. He would have to climb a ladder to get to the top of the barrel where a number of boards were removable. The barrels were filled with vinegar amongst other things. My friend would remove the boards, a guy in a loader would dump a load of cucumbers in the barrel and then the loose boards would be replaced. 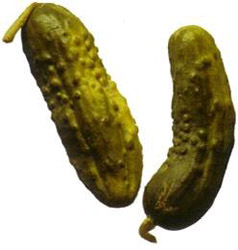 The cucumbers would be left for at least 6 months when the boards would be removed and the cucumbers would now be pickles. This particular pickle plant had a bad infestation of Groundhogs and my friend would often be given a bat to see if he could wander the grounds and maybe smash a Groundhog or two. It was not uncommon for the boards to be removed, the cucumbers loaded into the barrel and before the worker got back to replace the boards a Groundhog would climb in the barrel to go for a swim unknown to the worker. The boards would be replaced and the barrel left untouched for the next 6 months. 6 months later the cucumbers aren’t the only things that are pickled in the barrel. The worker would remove the boards to find a pickled, bloated Groundhog floating belly up. But instead of getting a net and fishing the Groundhog out of the barrel they would use a meat hook! The hook would pierce the bloated body of the Groundhog and as you can imagine blood and guts would explode into the barrel with the rest of the pickles. Now the most disturbing thing about this is that they would go ahead and continue to bottle those pickles! As I said as far as I know my friend was telling me the truth which makes eating pickles a bit disturbing. Luckily I’m the only one who knows which company this story refers to!